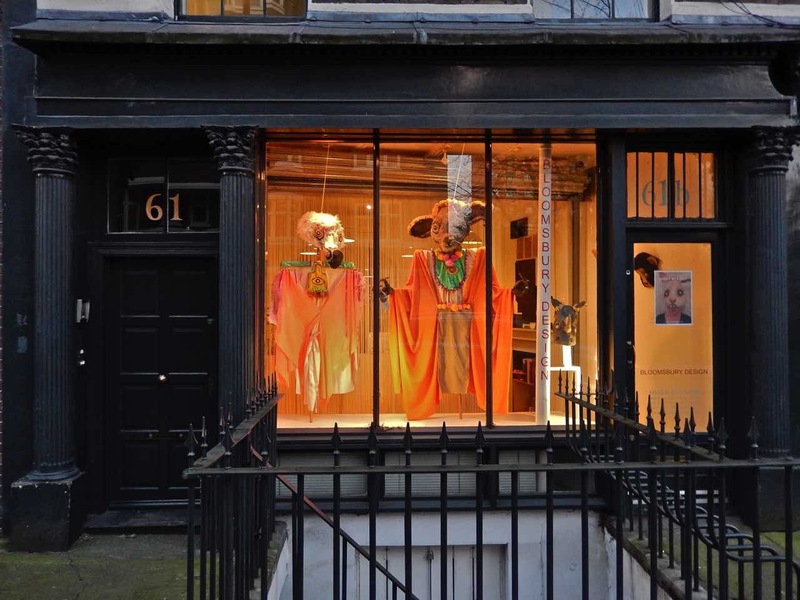 If you ever plan to write about Russian cultural figures in London, get in line behind Sarah J. Young. She’s already written about it, no matter what you want to say. And there is also this guarantee: She has done it really well. 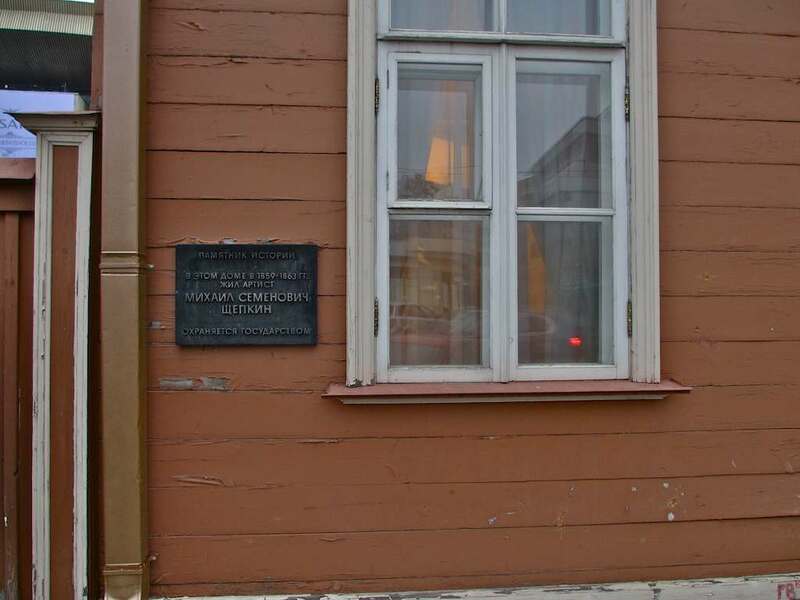 Today I pick on a topic she has fingerprints all over: the plaque honoring a location where Alexander Herzen ran his Free Russian Press for the years 1854 to 1856. You see, when the plaque was unveiled on June 26, 2013, at 61 Judd Place, Young was invited to aid in the ceremony. 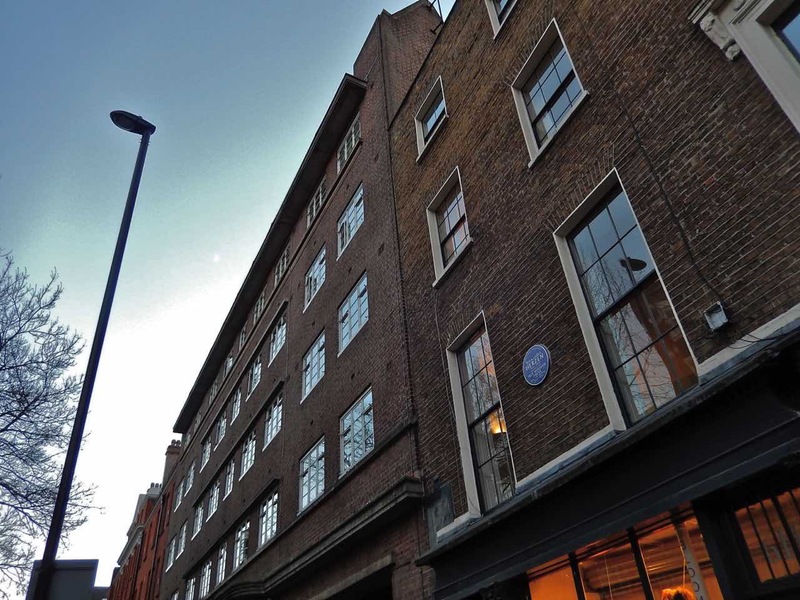 She had done much of the research leading to the choice of this address as the place where a plaque would be hung. 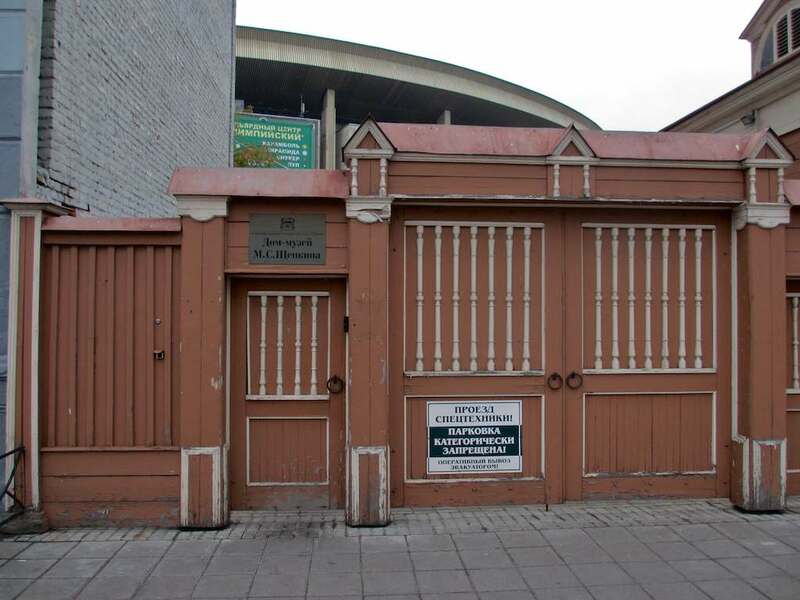 It was a no-brainer (the choice, not the research) because previous and subsequent locations were no longer of use – they had long been torn down. 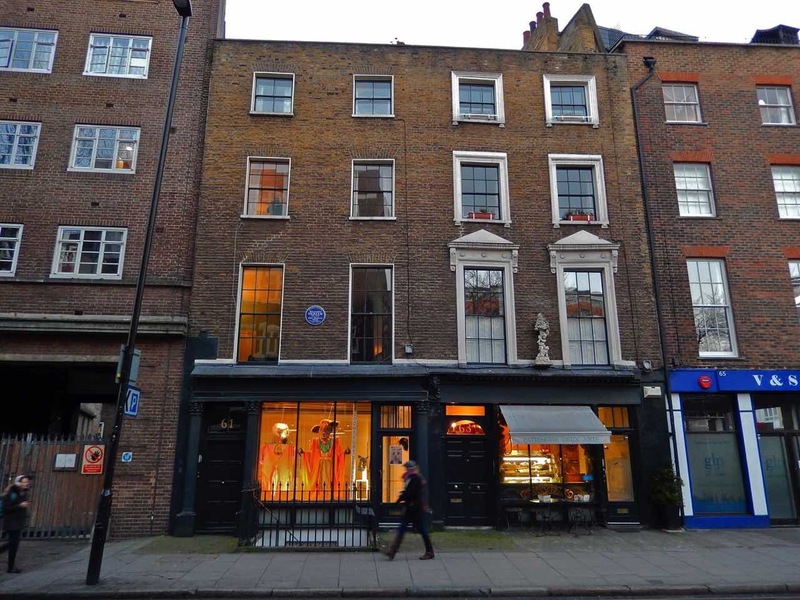 Necessary fact: what is now 61 Judd Place was 82 Judd Place when the Free Press was there. 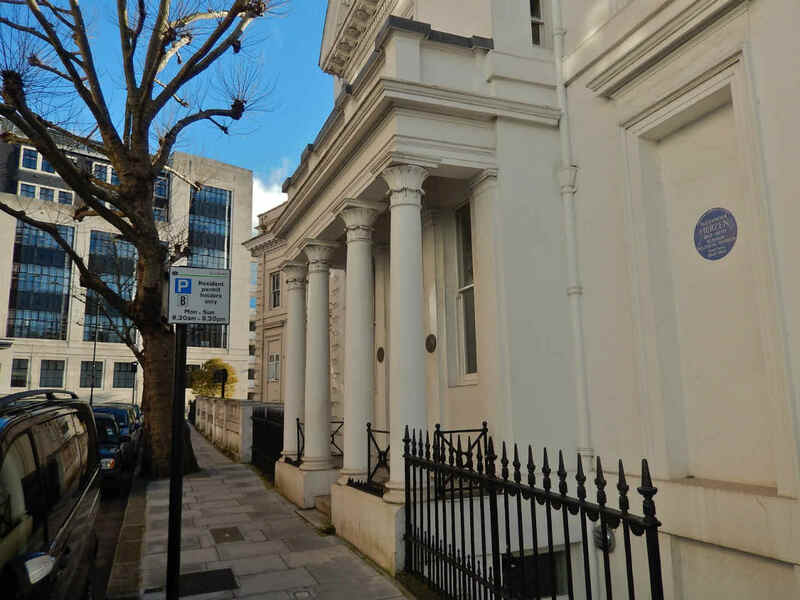 The Free Russian Press began its work, according to Russky London, “in the spring of 1853 on the premises of the already established Polish Democratic Press at 38 Regent Square (since demolished). 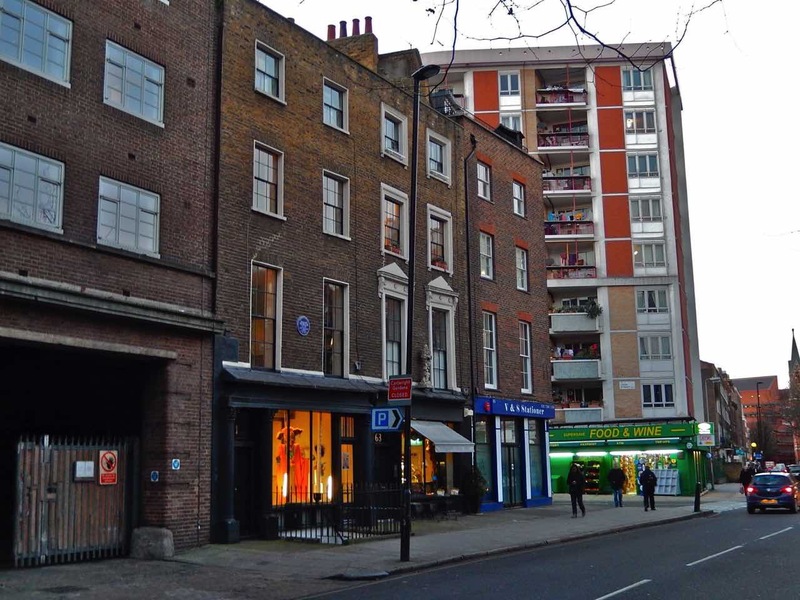 In December 1856 the press moved to 2 Judd Street, directly opposite number 61 (since demolished and now the site of a dog-walking area).” Sarah J. 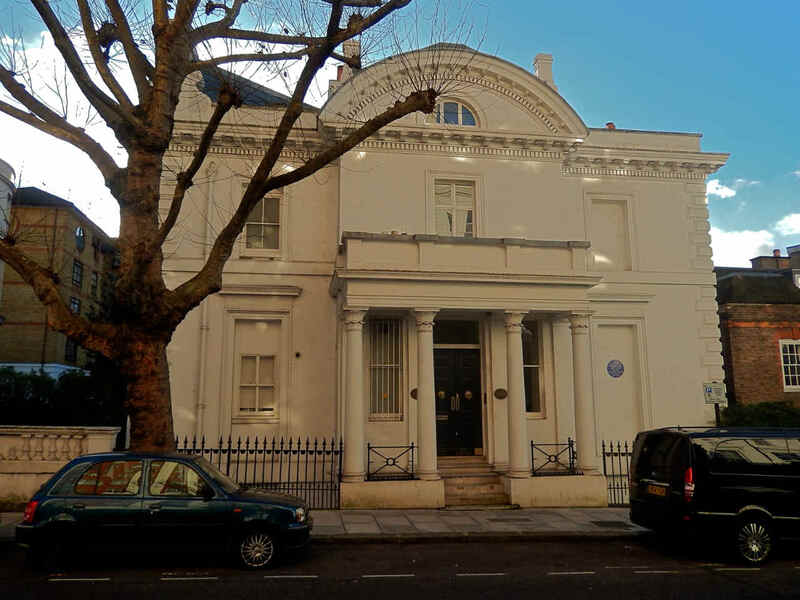 Young, as always, offers clarification here in her exhaustive blog about the Press: she tells us that Herzen moved the Press from Regent Square to Judd St. in December 1854. 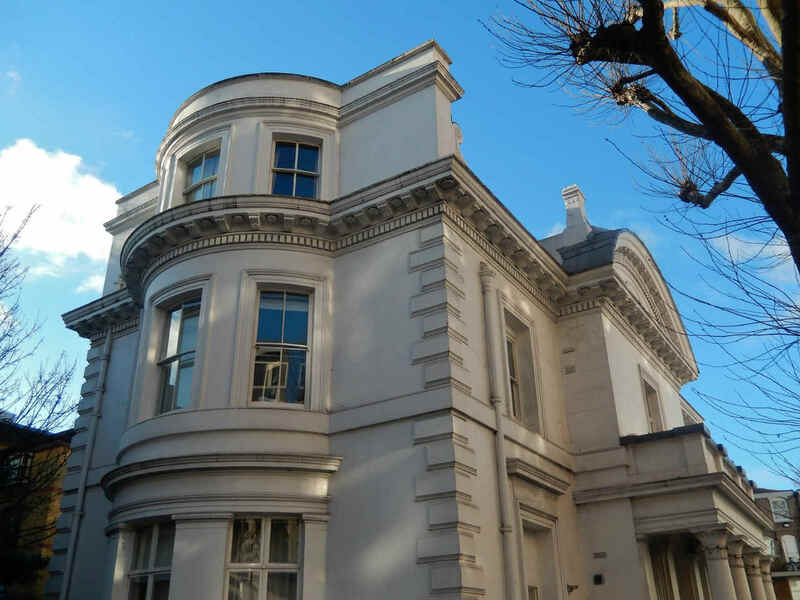 Wikipedia misses the first address at Regent Square, but provides all the other various locations from which the Press worked in its London years of 1853-1865. Herzen ultimately moved the Press to Geneva in April 1865, but turned the workings of it over to a colleague. It closed in August 1867, having spent time at two Geneva locations: Pre l’Eveque, 40, and Place Bel-Air, Ancient Hotel des Postes. The early years at the location shown here were important for Herzen and the Free Press. 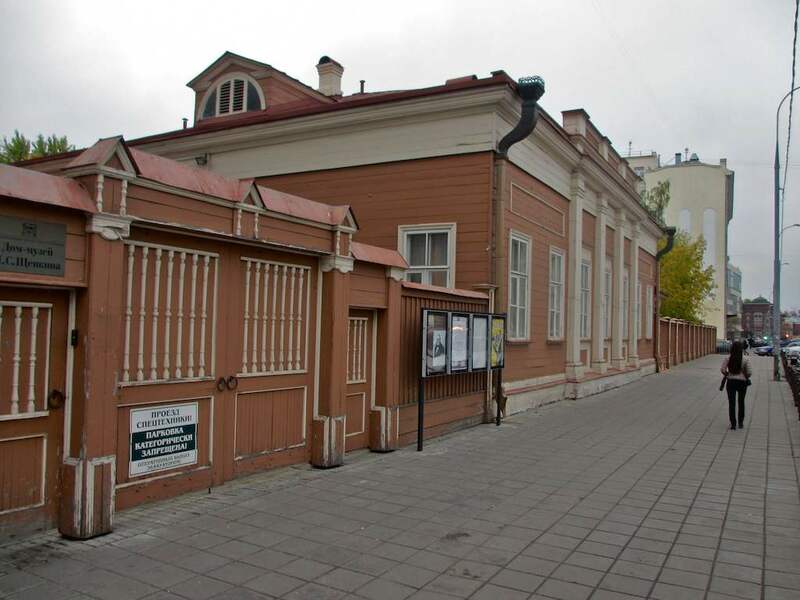 It was here in August 1855 that he began publishing his famous Polyarnaya Zvezda (The Polar Star) periodical. The second issue came out only in May 1856. The Press remained at the first Judd St. location until the middle of December, 1856. 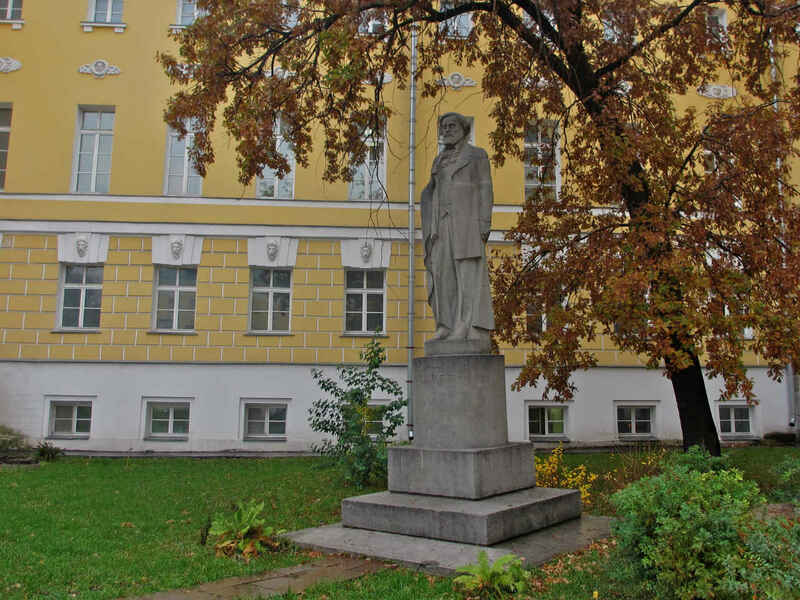 In addition to journalism, the Free Russian Press published numerous works banned in Russia, including poetry by Alexander Pushkin, Mikhail Lermontov and others. 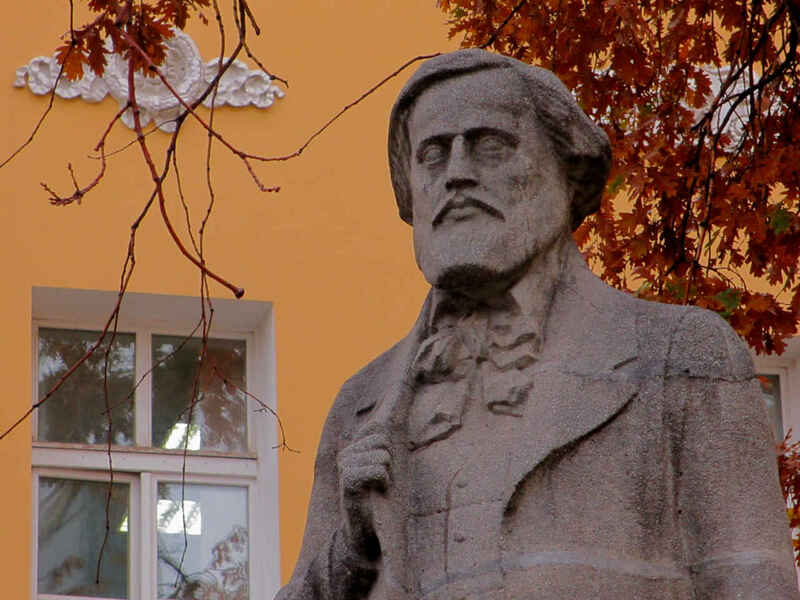 It reprinted Alexander Radishchev’s seminal Journey from St. Petersburg to Moscow. For the record, Françoise Kunka published a book in 2011 entitled Alexander Herzen and the Free Russian Press in London: 1852 to 1866. Of all the places I could be today (save Chania, Crete), I think I would choose London. Maybe it’s the old blood burbling up in whatever is in me of my mother’s line. Maybe it’s because I seem to have the extraordinarily good luck of invariably hitting London when spectacular weather reigns supreme. Maybe it’s because the city is just so damn beautiful, I can never devour it enough with my eyes. So, it’s to London we go today. Well, I guess it’s good to see that Western civilization is still dying – for, surely, it is doing that these days. 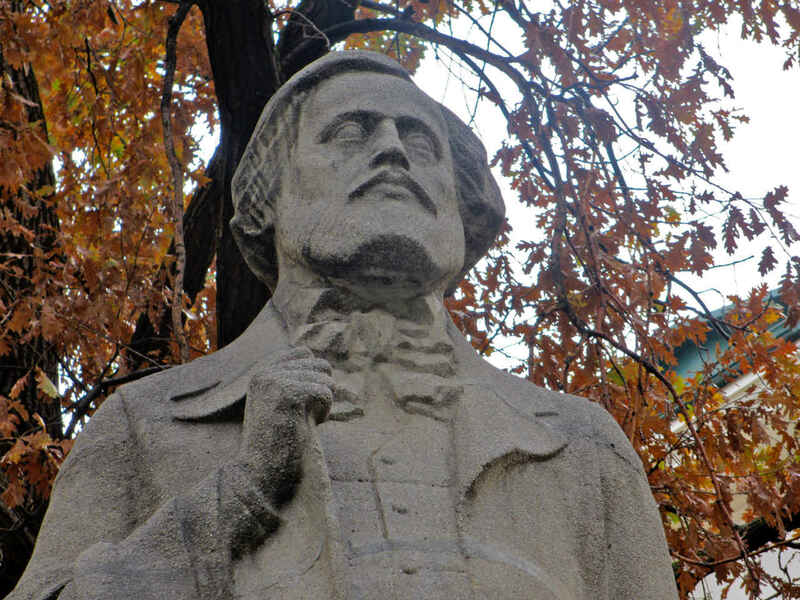 I am less happy to see that Turgenev did what so many of my contemporaries now do – agree to self-censorship when confronted by the authorities. But what is eternal is eternal, I guess. Finally, Schapiro’s comments allow us to say that Herzen’s “Ends and Beginnings” were surely written right here in the home you see pictured today. 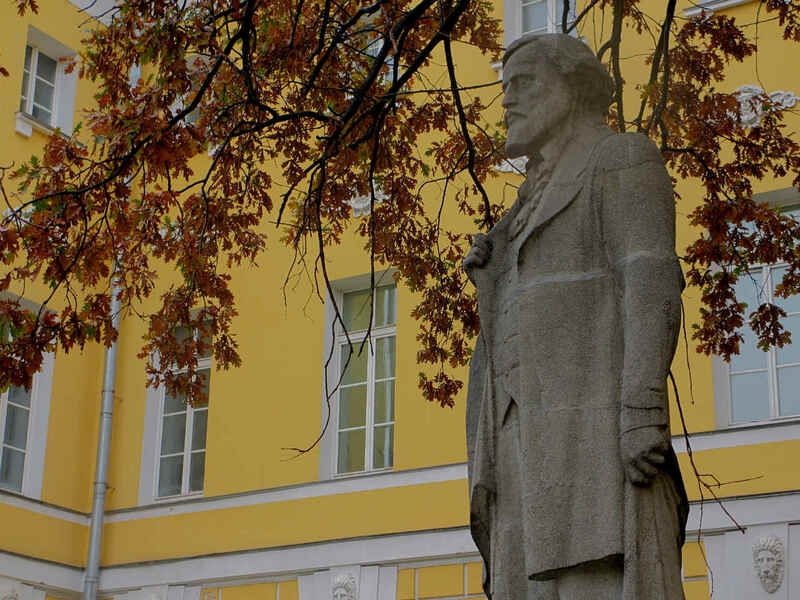 Nikolai Ogaryov (1813-1877) pretty much emerges from the shadows of the past by way of the light that Alexander Herzen casts on him. The two men were friends from childhood. 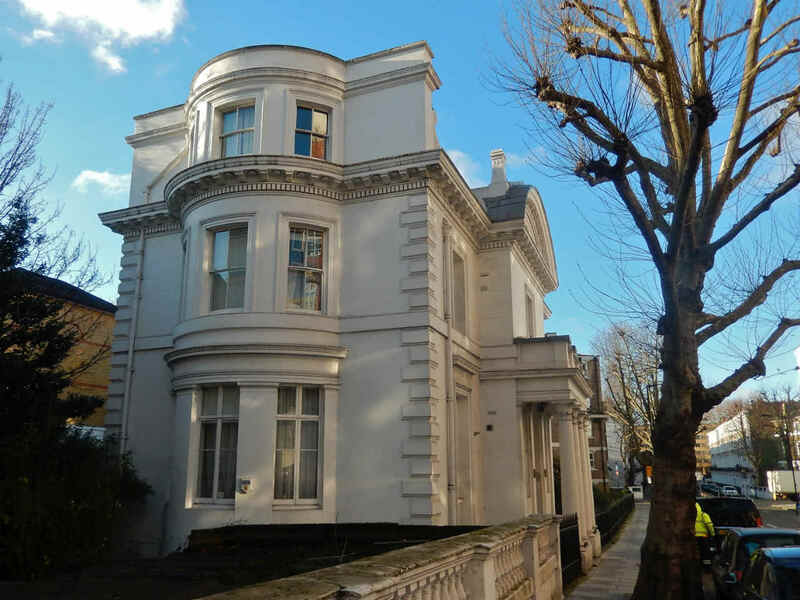 They shared common interests, they shared bold political views, they shared a life in emigration (primarily in London), they shared their women, they share a place in history together. 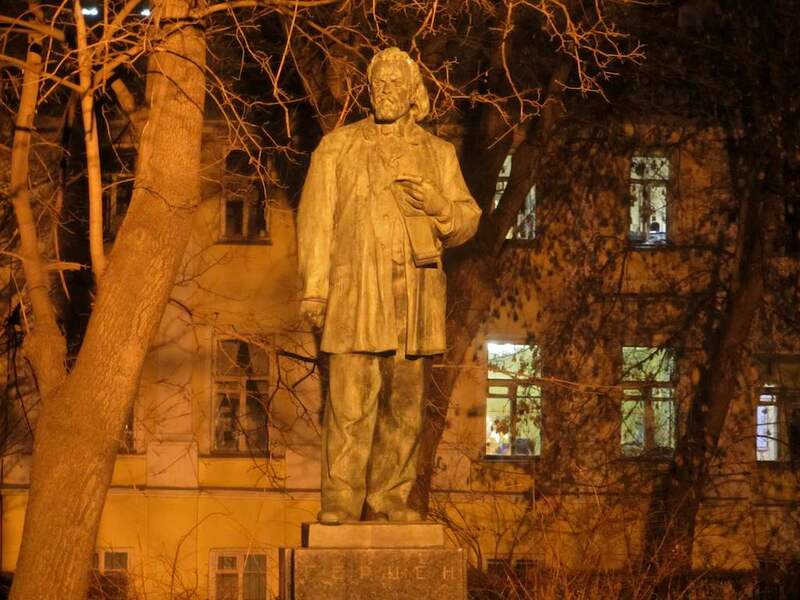 But by all accounts, Ogaryov was very much a personality unto himself, strong, quixotic, eccentric and interesting. Great poetry? I don’t know. It’s unfair to ask the question in regards to such a tiny chunk, all the more so in hasty translation. But what I like about this is the way it reveals the man; in fact, reveals his biography. 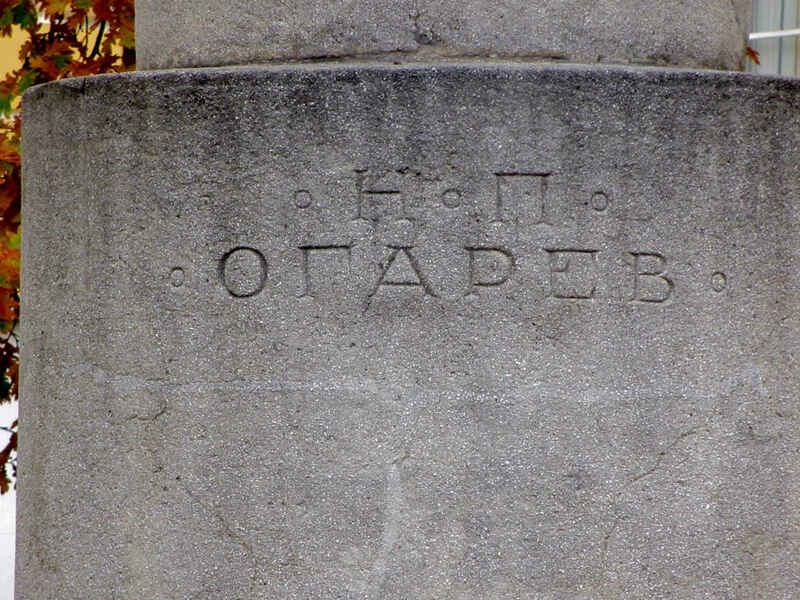 Ogaryov came under the suspicion of Russia’s secret police in the early 1930s and was arrested and sent into exile for the period from 1835 to 1839. When he was released he wasted no time skipping town and country, making his way to Germany in 1840. He remained abroad until 1846 then returned to his estate in Penza in 1846 where he briefly ran afoul of the law again in 1850. 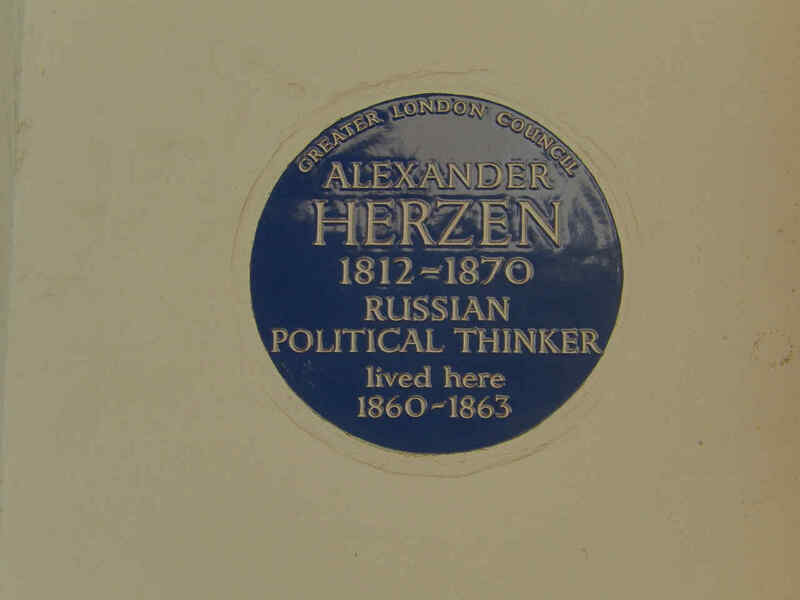 In 1856 he left Russia for good, heading directly for London, catching up with his old friend Herzen who had relocated there four years earlier in 1852. 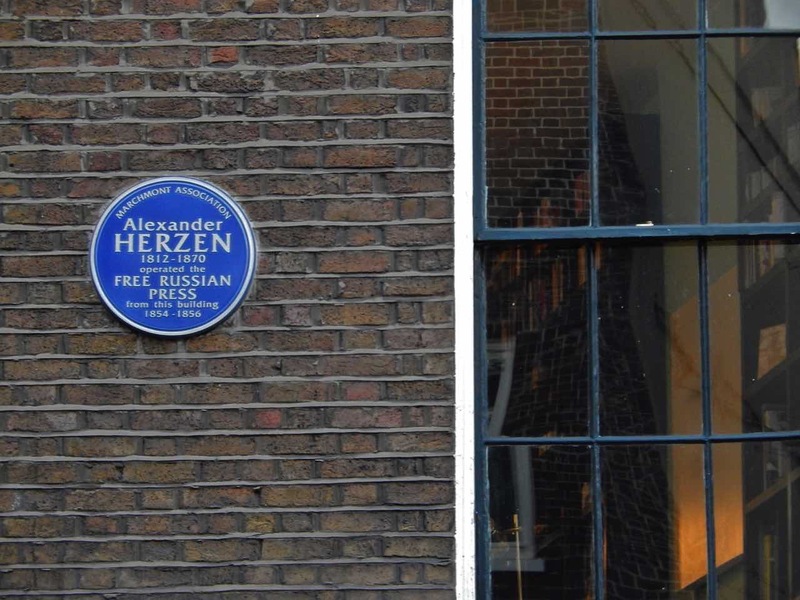 In London the two made history as Ogaryov stood alongside Herzen as the latter founded the Free Russian Press which published books and the, ultimately, influential periodicals Kolokol (The Bell) and the Polar Star, for both of which Ogaryov often wrote articles. In time, these writings made their way back to Russia and had a strong effect on liberal and radical thinking there (although radicals soon turned against both for being “too soft”). 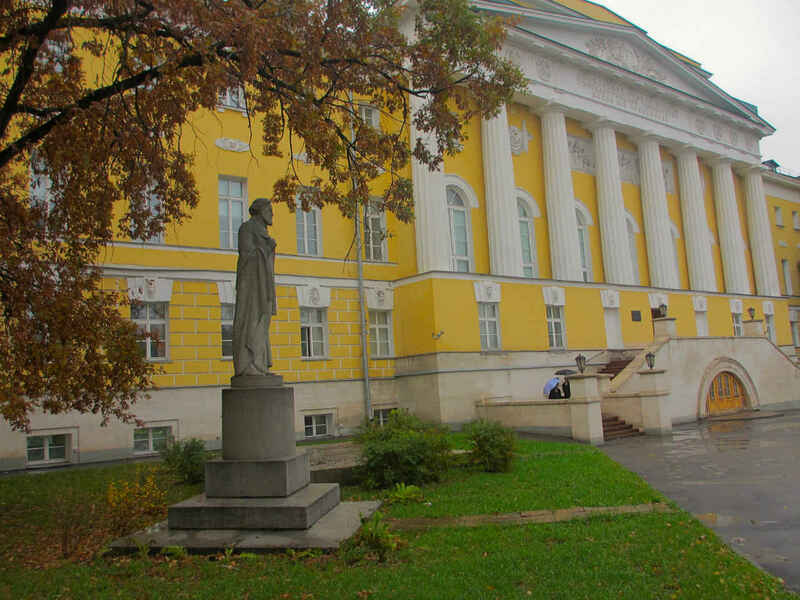 The statue of Ogaryov pictured here stands near the entrance to the main building of Moscow State University in the center of Moscow. 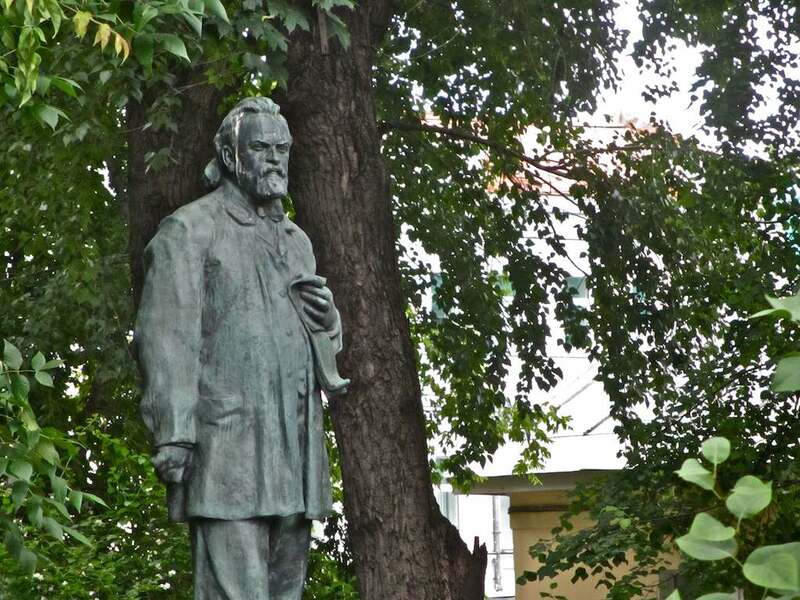 Looking quite blissful, I would say, Ogaryov stands to the left of the entrance (if we face the doors ourselves), while his old friend Herzen looms like a bookend on the other side. 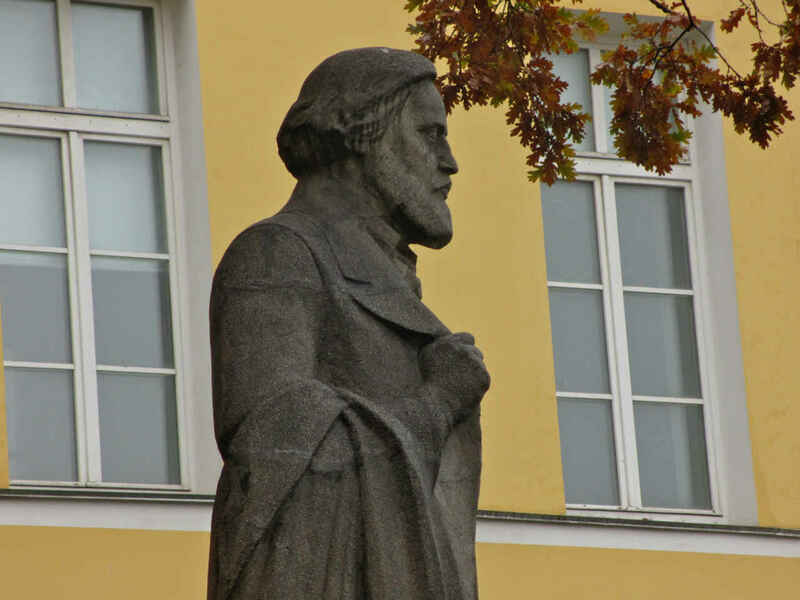 The two statues, created by Nikolai Andreev, were unveiled the same day, December 3, 1922. 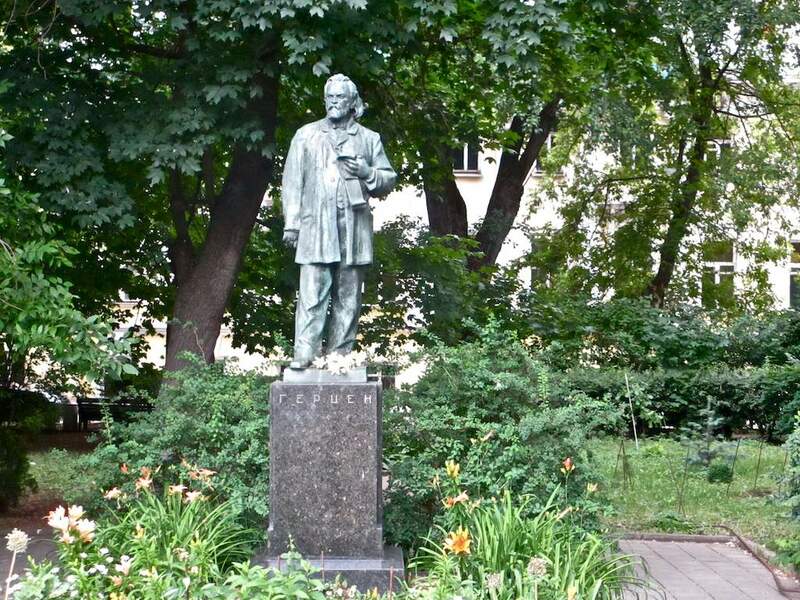 The address corresponding to the square where the statues stand is Mokhovaya Ulitsa 11. Why do the two stand here? Both studied at Moscow State University and both became involved in underground revolutionary activities while here. They went on to become two of the most illustrious revolutionary alums to graduate from Moscow State U. No, it’s not Tomsk. It’s smack dab in the middle of Moscow, a long block from the busy thoroughfare known as Prospekt Mira (Peace Prospect), the metro stop named after that prospect, and a stone’s throw from the Olympic Sports Complex, the rounded roof of which you can see looming in the low sky in a couple of photographs below. 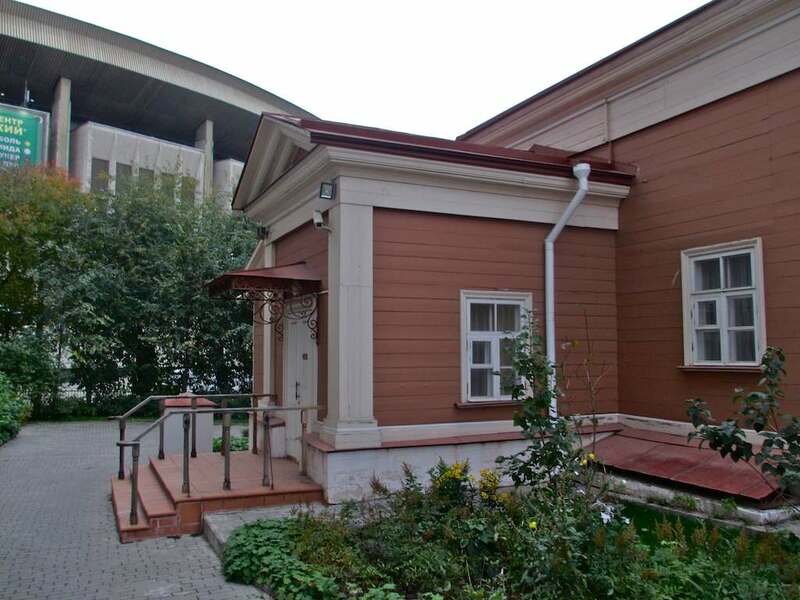 Today we’re looking at the old, wooden home in which Mikhail Shchepkin, the great Russian actor of the 19th century, lived for the last four years of his life, from 1859-1863. 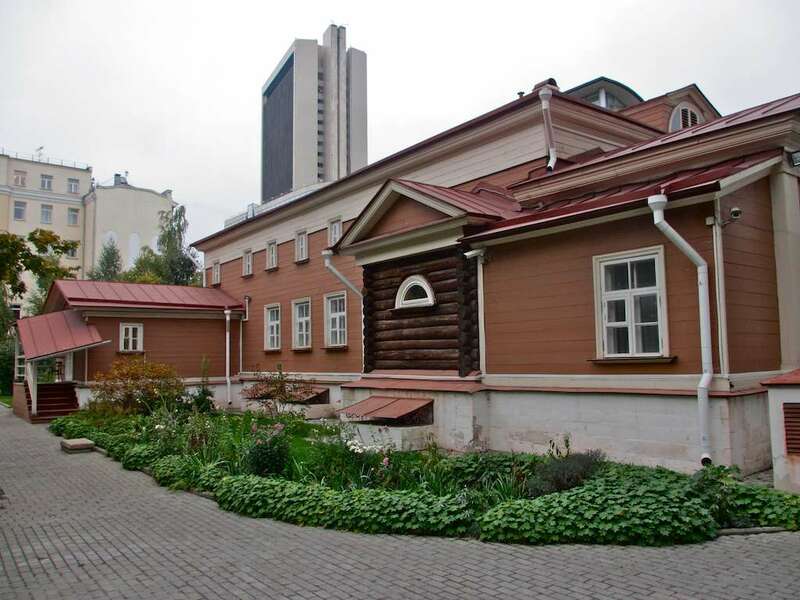 There are still a few wooden structures left in Moscow, but this is surely one of the biggest and most interesting, in part because of the good shape it’s in and in part because of the history attached to it. 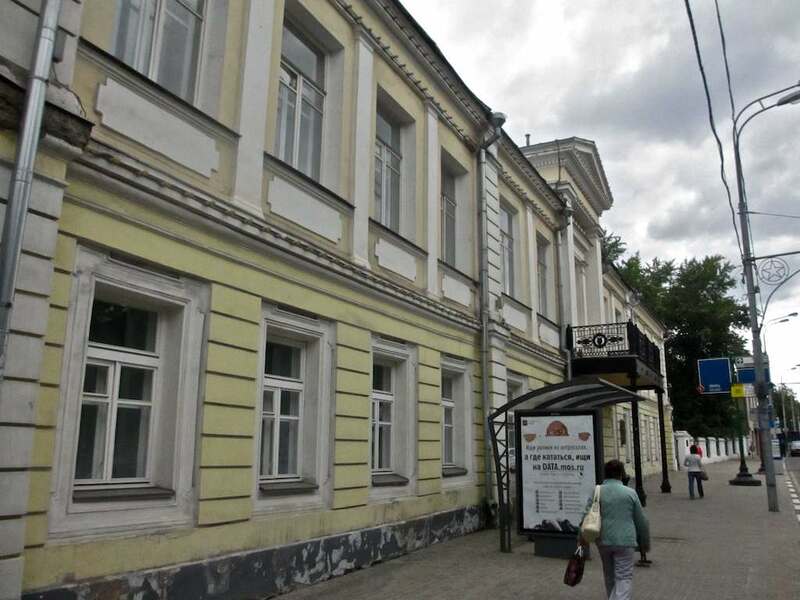 The street here was named Third Meshchanskaya Street when Shchepkin was resident; it has been called Shchepkin Street since 1962. 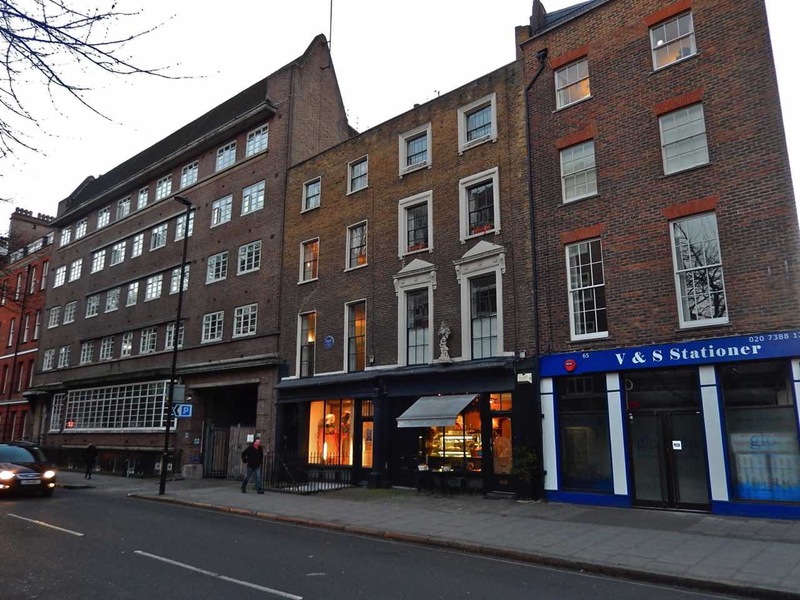 As several of the photos show here, the structure is rather under siege from less attractive, less ornate, more imposing modern buildings. It does look a bit out of place among its neighbors, I must say, but that only makes you appreciate it more. Especially when you step through the gate and see the house from the inside courtyard (the first two photos in the final block below). 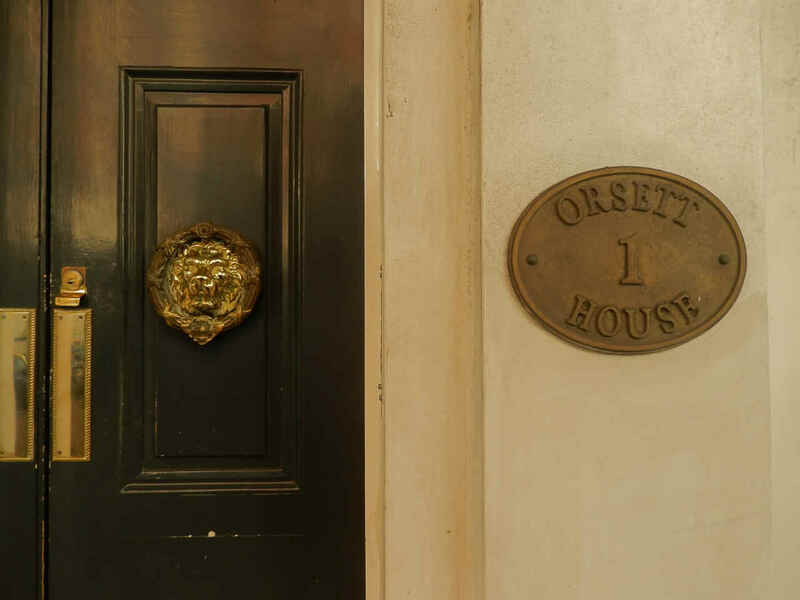 The address here is house No. 47. 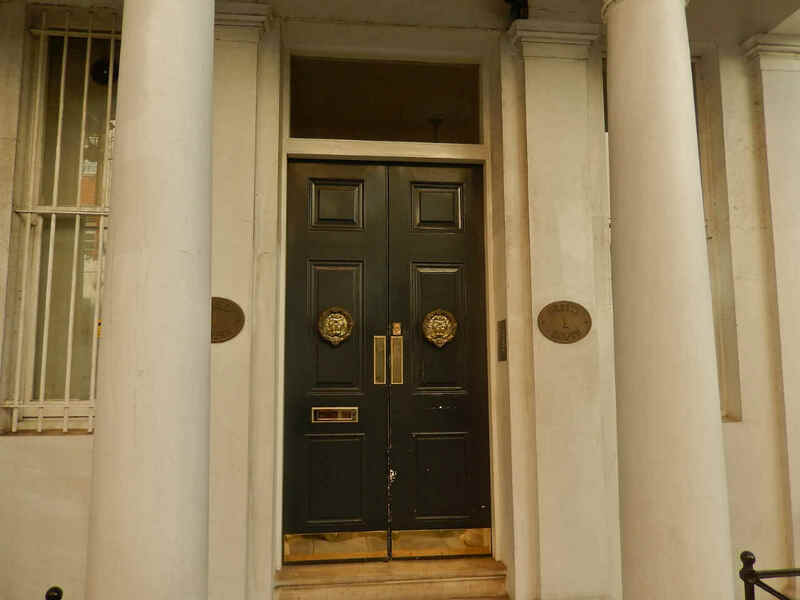 These days the official address also has a “building 2” attached to it. Still, having said all these nice things about this building as one of the few such remaining in Moscow, the truth must also be told. Shortly after Shchepkin’s death the house passed into the hands of a family that significantly reconfigured the facade, and not only the facade. 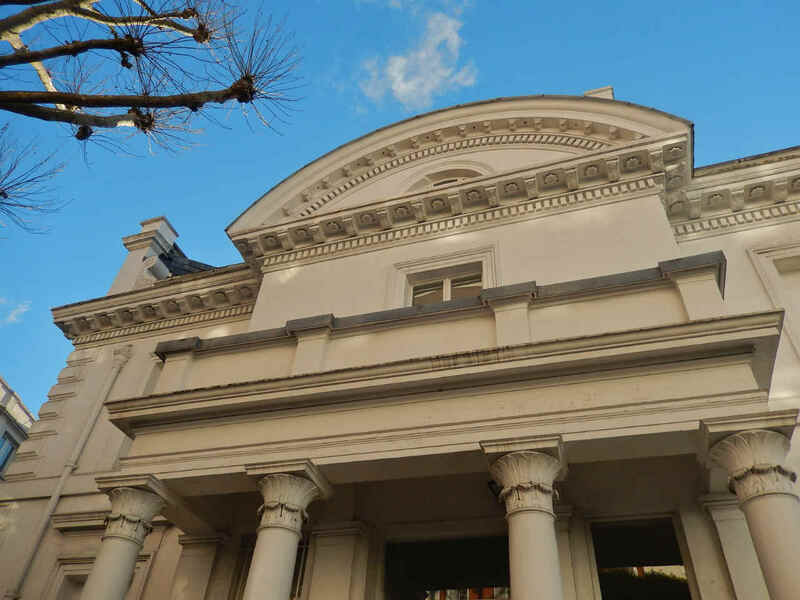 It was given a facelift with stone columns and detailed, fanned bas reliefs that lasted until the late 1990s when the additions and changes were removed and the building, more or less as Shchepkin knew it when he lived here, was restored. 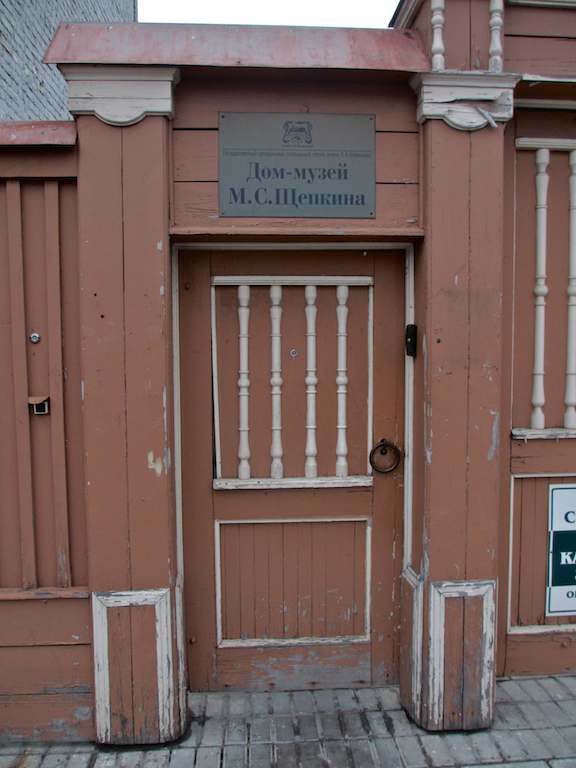 You can see photos of what the building looked like from 1865 to the late 1990s at the wonderful Know Moscow website. 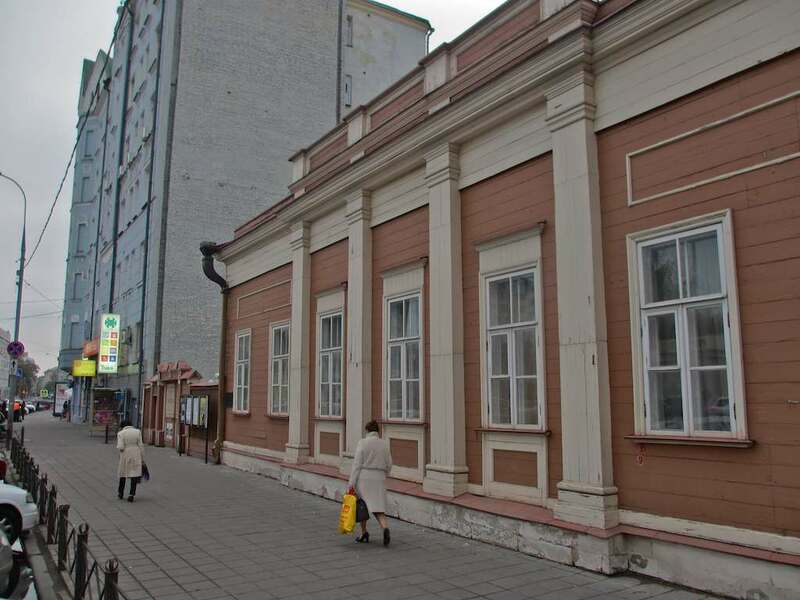 Today the structure houses a museum honoring Shchepkin, as well as a working theater company called the House Theater at the Shchepkin House, run by a very cool cat, Anatoly Ledukhovsky. I have drawn some of this latter information from the Chronos biography site. Andrei Platonov (1899-1951, real last name Klimentov) is a writer about whom you will often see the words, “the best writer you’ve never read.” At least that’s true in the English-speaking world. Most of Platonov’s works – he wrote novels, stories, poetry and plays – were buried in the noise of their time. The vast majority of them have come back to us in recent decades. He was already in the process of being rediscovered in the late Soviet period, but it was after the fall of the wall that he came to us more or less in full light and full flight. 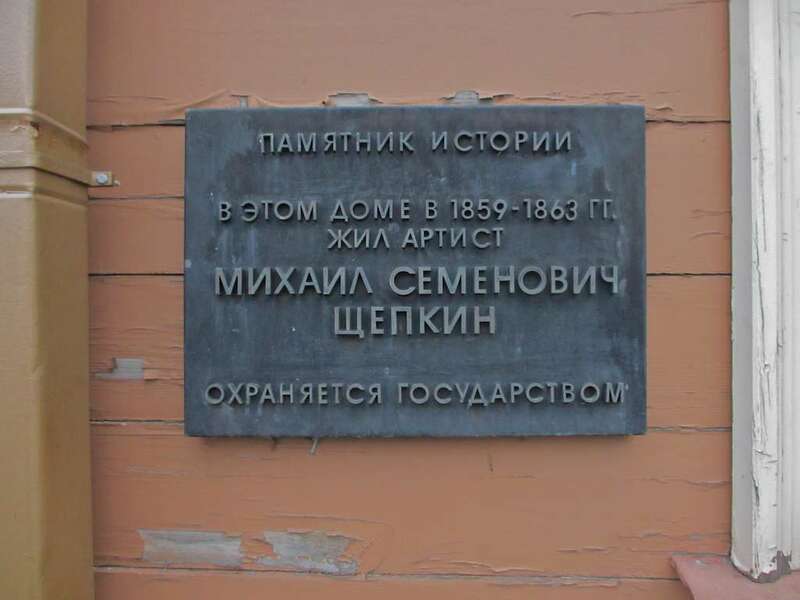 The plaque commemorating the fact that he lived at 25 Tverskoi Boulevard (not to be confused with Tverskaya Streeet) from 1931 until his death in 1951 is the work of sculptor Fedot Suchkov. 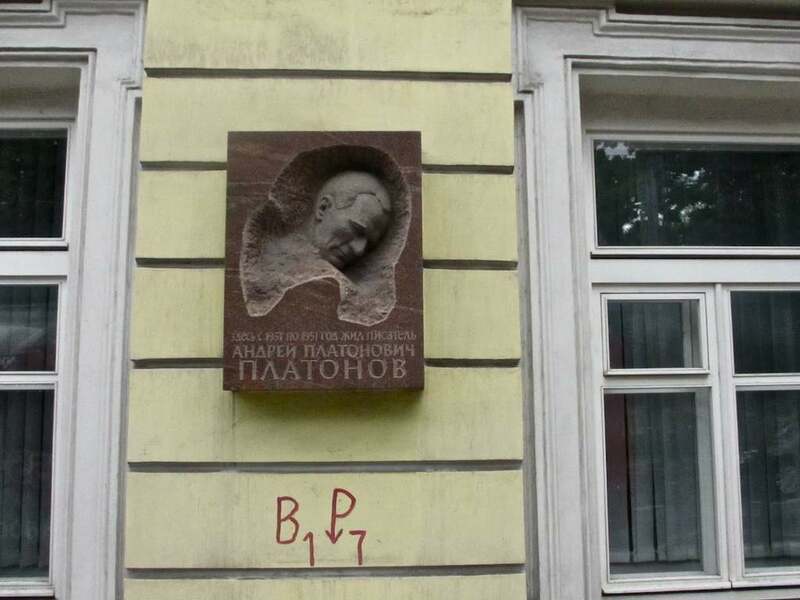 According to Suchkov’s memoirs the bas relief that he created for the plaque originated in a bust he had made for the Platonov family and which was kept in the family home. Heinrich Boll, the great German writer and an admirer of Platonov, purchased a copy of the bas relief for his own personal collection. 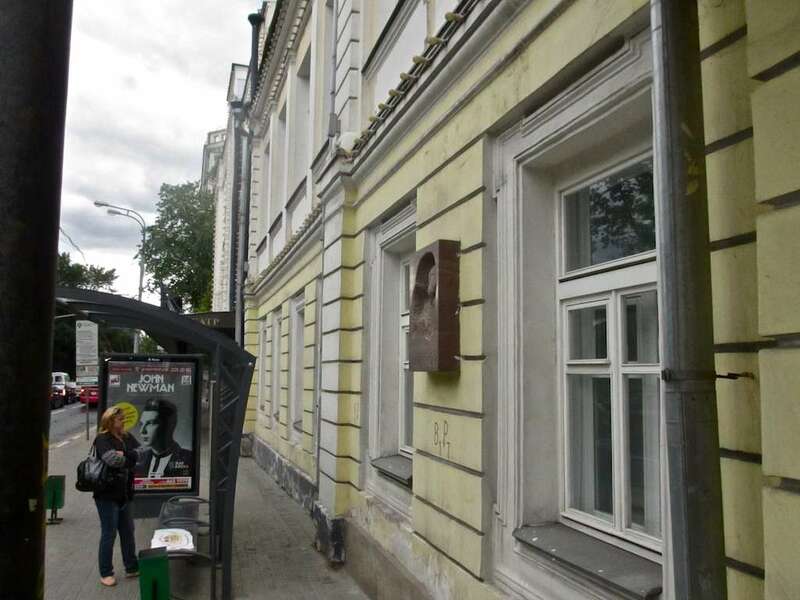 The plaque hangs not far from another honoring the fact that the poet Osip Mandelshtam also lived at this address for a brief period in the early 1930s. 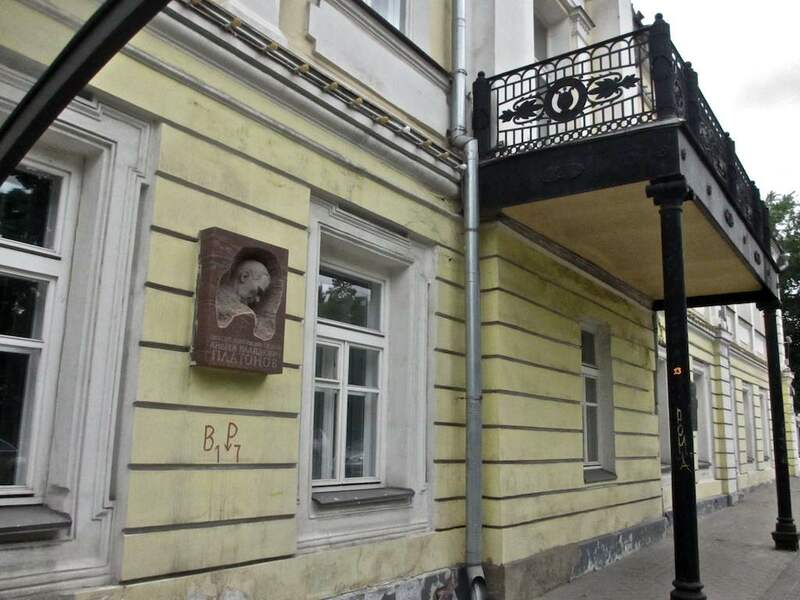 This is the same home in which the 19th-century publicist Alexander Herzen was born, and where the Gorky Literary Institute is located, all of which I have written about previously in this space. Platonov’s sister-in-law Valentina Troshkina would later recall: “Andrei worked here a lot, he would take his writings to publishers, but only rarely could he publish under a pseudonym. Friends would sometimes gather on Tverskoi. 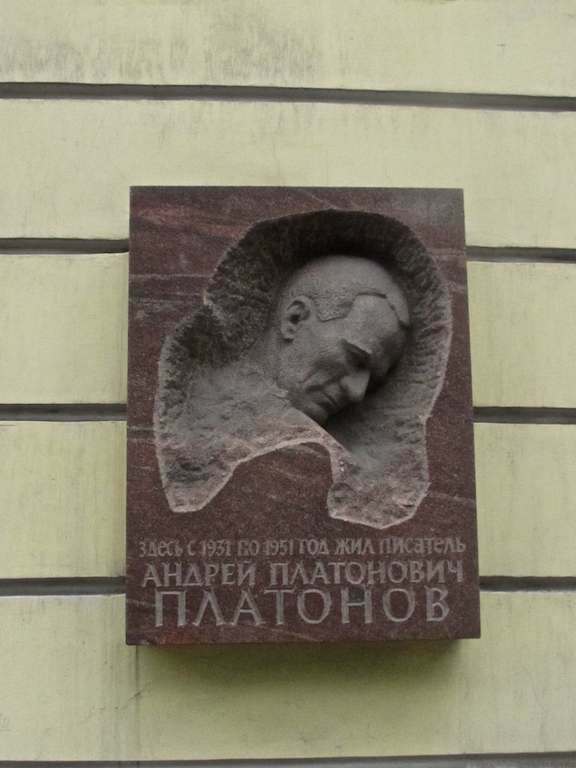 Guests included [Mikhail] Sholokhov, [Alexander] Fadeev, Georges Chernyavshchuk, a marvelous person, although people said various things about him.” Troshkina’s comments, like those of Suchkov, are published in memoirs published on Platnov.narod, a fan-maintained website for the writer. Troshkina tells another story I had never heard: When the Germans approached Moscow during World War II many Muscovites were evacuated, Platonov among them. According to Troshkina, he left almost his entire archive of unpublished writings with Troshkina’s husband Pyotr for safekeeping. Platonov took only one thing with him – a piece he called Journey from Leningrad to Moscow, based in spirit, at least, on the great Journey from Petersburg to Moscow by Alexander Radishchev (about whom I have written in this blog). The work apparently meant so much to Platonov that he actually tied the manuscript to his arm when he slept in the train, but somewhere, at some point, the string holding the valuable work of literary art either slipped from the author’s arm or was clipped by a thief who surely had no idea what he or she was stealing. Thus disappeared a potentially major work by Platonov, one he worked on for eight years, mostly at the home on Tverskoi Boulevard. It is impossible to imagine Soviet literature now without Platonov somewhere in the center of it. 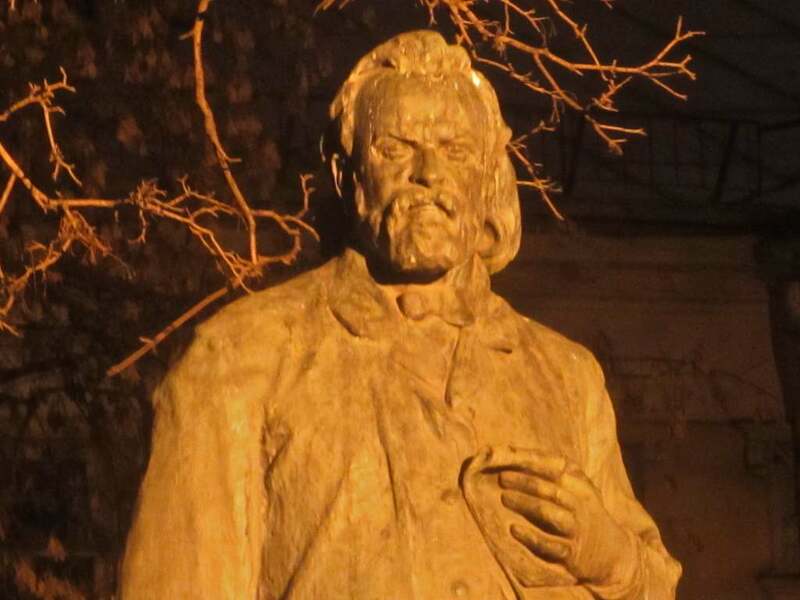 His strong, unique, innovative language conjures up a whole era of Russian/Soviet history. His unblinking pictures of the difficult human condition, along with his unbending humanist convictions, make for literature of genuine power and impact. I never paid much attention to Alexander Herzen (1812-1870). Until recently that is. It’s not Tom Stoppard’s Coast of Utopia trilogy about Herzen and his revolutionary friends in London that did it; I actually don’t think much of that piece. 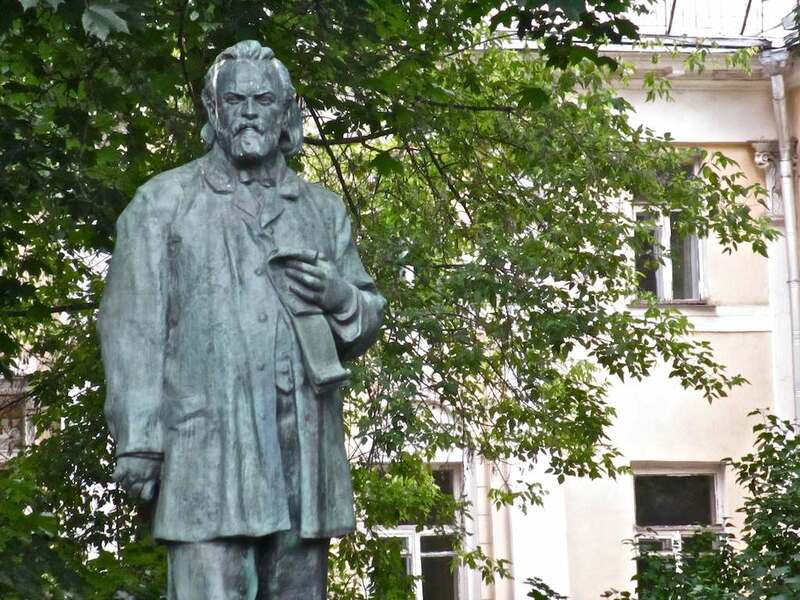 But as a radical thinker, a rabble-rouser, a skeptic and an activist, Herzen increasingly comes to mind when I think about the pathetic state of affairs the world has gotten into. 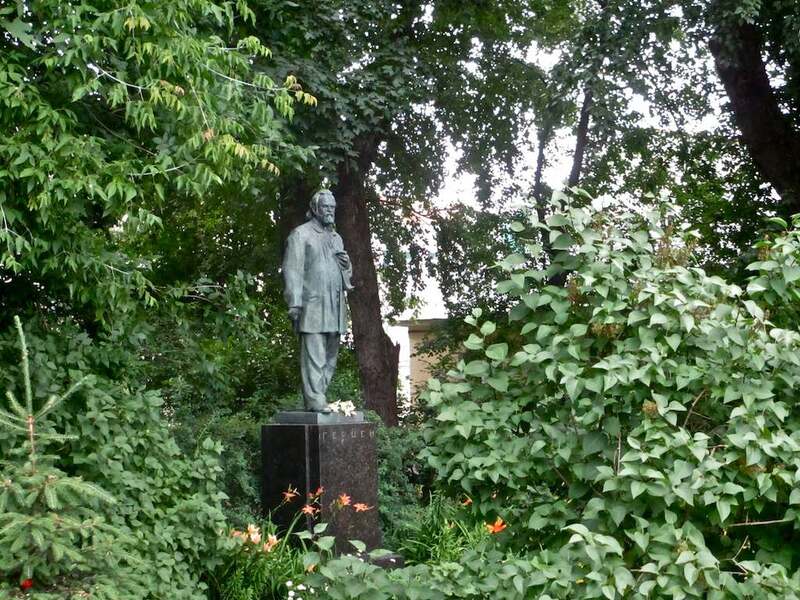 The statue of him in Moscow is quite small; a very neat, compact likeness. 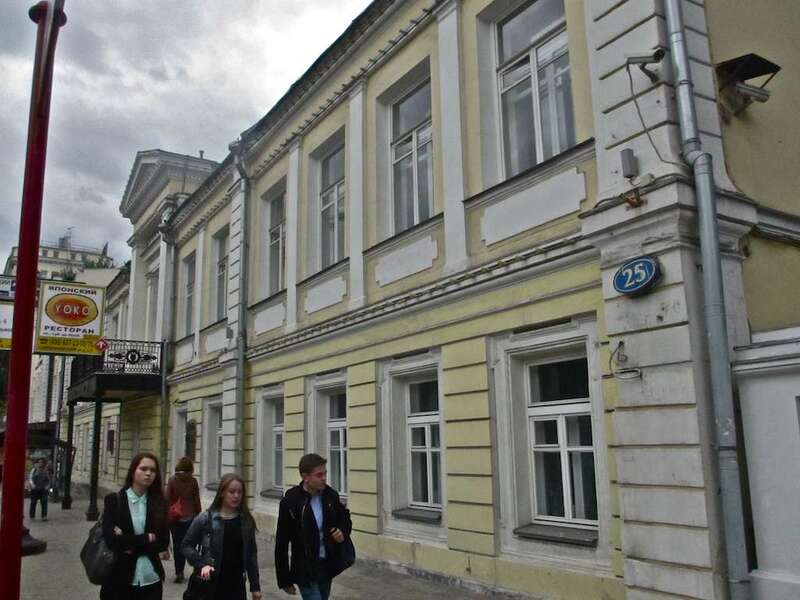 It is located on Tverskoi Boulevard in the courtyard of the Herzen Literary Institute, right next to the yellow, two-story building in which the future political writer was born, illegitimately, to a young German woman roughly two months before Napoleon invaded Russia. In the last 25 years I have passed by the statue hundreds of times, surely. But I only began to notice it a year or two ago. Thus do world crises affect our ability, or inability, to see. I first photographed it eight to ten months ago (the two shots at the bottom) on a cold, barren, wintry evening while I was on my way to see a show at the neighboring Pushkin Theater. Everything was washed in a thick layer of yellow light. That, and the scraggly trees around him, made Herzen look lonely and distant. Then I photographed him again in June. It was my birthday and I was walking around Moscow shooting all the cultural icons my lens could find. When I came upon the great man this time there was something incredibly joyful and rich and powerful about his presence. The “something” was no strange secret, of course, it was the lush greenery surrounding him that did it. The billowing, cascading leaves made Herzen stand up straight and strong and give me an admirable, hard look. I lingered around him for some time, feeling quite at home in his company. Yes, I can’t help but add, we do know our Napoleons! Ah! Stab me in the heart, why don’t you? A man after my own heart. Alexander Herzen.